Over the weekend, and being an impulsive fool, I decided to upgrade my mobile phone. Well, actually I blame my service provider for playing games with my tariff & offering me a more competitive deal if I upgraded… but I digress. So, here I am with a Samsung Galaxy S2 I9100. It’s a very nice phone – although after 5 years with my purse-and-pocket friendly Sony Ericsson W810i Walkman, it’s taking a little getting used to size-wise. 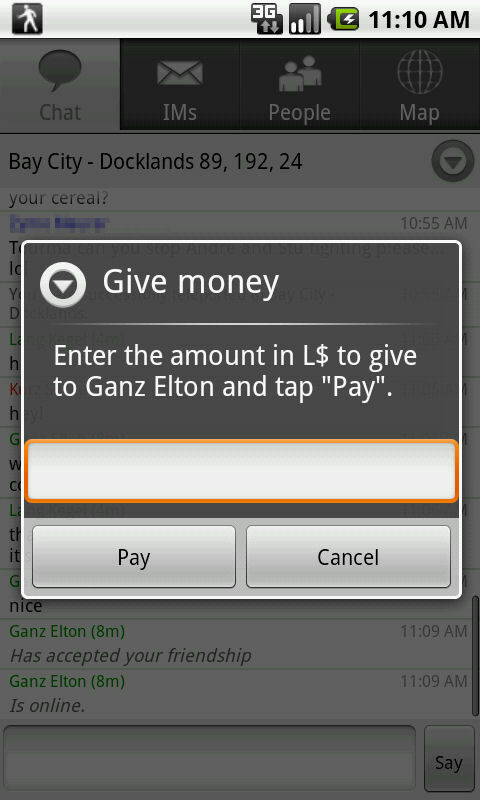 It does have lots of whizzy on it I’ll probably never use (just give me my music when I’m on the go, and I’m happy) but it has allowed me to take a look at another SL text client that is out there – the Mobile Grid Client for Android. The app itself is free via the Android Market, although you can only use it for 14 days prior to being asked to pay a minimum of L$250 a month to continue to access SL. Not a steep price by any means, but a little unusual in the client stakes. Once installed the app appears in your application listing / grid, and tapping it takes you directly to the local chat screen (if using it for the first time) or the last screen you were using when you logged out, with the message Not logged in. Tapping your ‘phone’s menu button should display the application’s About and Login buttons, together with the phone’s Settings option. Tapping Login unsurprisingly pops-up the login overlay. You’ll need to enter your avatar name entirely in lower case, although the password field is case sensitive. Note that if your initial 14-day trial period has expired, you will see the payment option (left). The minimum amount for continued use of the application is L$250 for a month’s usage, although you can optionally pay more. The charge itself is non-recurring, so there is no danger of your SL account being repeatedly billed whether or not you continue to use the app; the payment prompt will simply appear once more when your month’s use is up, and you can then make a further payment and continue using the application or simply stop using the app – the choice is yours. Also on the login screen there is a CHANGE option that you can use to access any OpenSim grid. 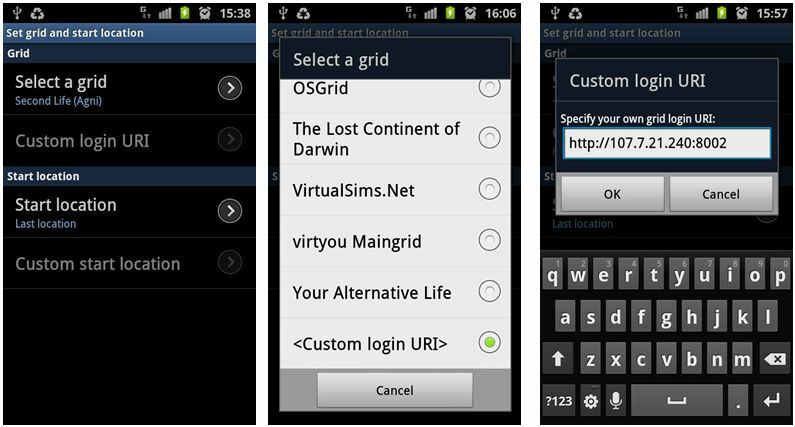 Tapping this will display a series of options (below left) which in turn allow you to set your login location, and choose from a list of pre-defined grids (below centre). There is also an option to set-up a custom grid URI, but slightly confusingingly, this is initially greyed-out and unavailable – you have to go into the pre-defined list first, scroll to the end, click on an option to enable custom URIs there, which takes you back to the initial screen with the Custom option now enabled. Tapping on it then takes you to a screen where you can enter the required URI (above right). The logging-in process takes a long as you’d expect a Viewer to take – no surprises, given the same steps are being taken – and chat will display things like the MotD as things progress, followed by a confirmation that you are logged-in. 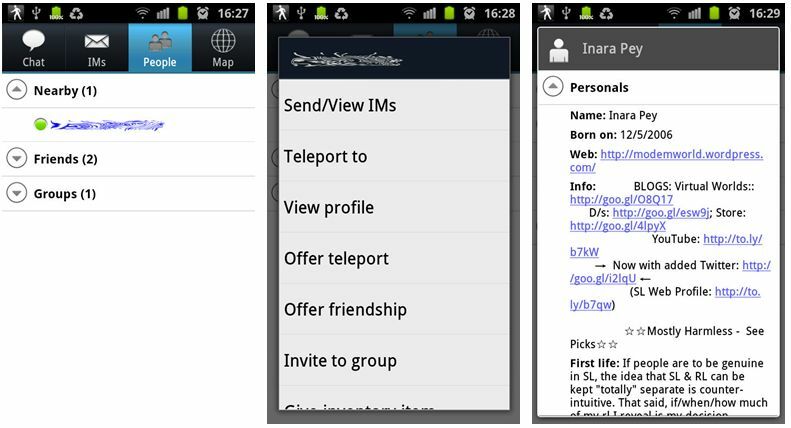 Green: you received a new IM, group IM (group chat message) friendship offer or teleport offer. 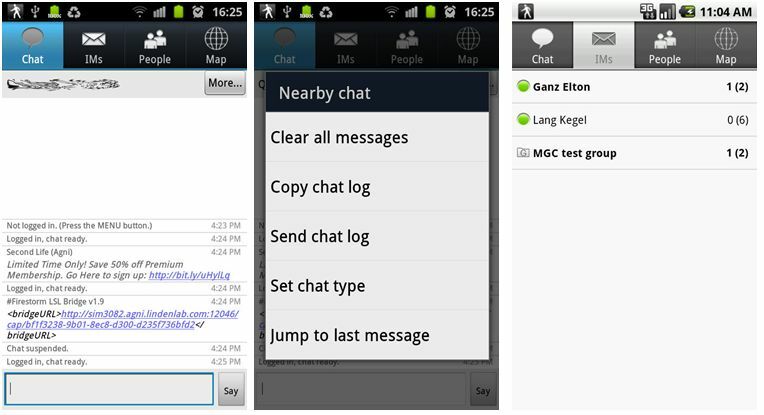 As well as displaying your chat history (below left), Chat has a MORE button which displays a menu to further chat-related options (below centre), while pressing and holding the SAY button brings-up a menu alloing you to switch between Say, Shout and Whisper for your own chat. The IMs button displays a list of you current IM conversations (above right), allowing you to quickly swap back and forth between them. When you are in an IM with somone, a MORE button is displayed, providing you with all the actions you’ve expect to be able to use: view their profile, offer a teleport, invite into a Group, pay them, give inventory, and so on. People combines the functions of Nearby People, Friends and Groups, again allowing you to carry out a range of actions – IMing an individual, viewing their profile, offering friendship / teleport, teleporting to them, paying them, giving inventory, etc – simply tap on a name to display a menu of options. The profile view is interesting – selecting it take you to an initial screen that asks you to select Personals – personal information; Groups – group information or Picks. Once in any of the three options, you can swap between them easily by scrolling down / up and tapping the relevant heading. The personal view combines SL information with any available RL info a person has added to their profile. Making full use of Android, any links are enabled and tapping them will launch your phone’s browser and seemlessly display the relevant webpage. Tapping the phone’s RETURN key drops you neatly back into the profile view. The Picks option doesn’t actually display any images associated with a person’s Picks, but when tapped, will offer to teleport you to that location. 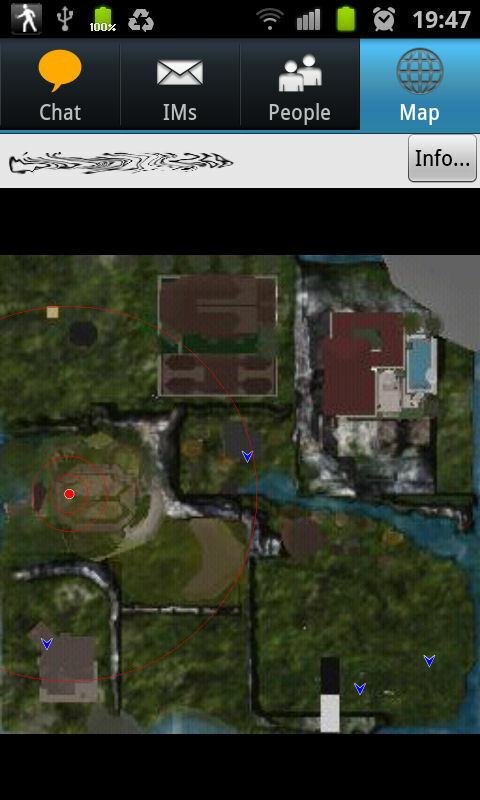 Map brings up the map of your current location, with an option to call up additional information (region name, parcel details, your exact position, music stream URL, etc., with items such as the region SLurl being clickable). The map itself displays cleanly and is easy to read – the screen capture doesn’t really do it justice compared to seeing it on the screen of an S2. A MORE button calls up an additional menu which has opens to teleport yourself home and to open SLurl.com. Inventory functions are very well represented, allowing you to carry out a wide range of tasks associated with your inventory – browse, search, create folders, move and / or rename items, read notecards. trash items, and so on. Inventory is accessed by tapping you phone’s menu button and then selecting the Inventory option from the pop-up menu. Your inventory is displayed much as it appears in a Viewer (below left), and tapping on a folder will open it (together with a BACK open at the top), tapping on an item in a folder will bring up a context-sensitive menu (below centre). Sadly, when it comes to clothing and attachments there are no WEAR or ADD otpions, but you can view properties, give items, deleted them, move them, etc., and in the case of notecards, biew the contents. You can also create new folders and sub-folders in your inventory (above right) using your ‘phone’s menu button and tapping Create Folder from the displayed options. You can also access an inventory sort option via your ‘phone’s menu button as well. This is a fast, effective text client that offers an excellent means of rapid-fire access to SL should you need it when out roaming. Data fees being what they are, unless you have an inordinate download allowance on your tariff, however, this is not the application for casual use over 3G or similar; SL eats bandwidth as we all know – even when running a text-based application. 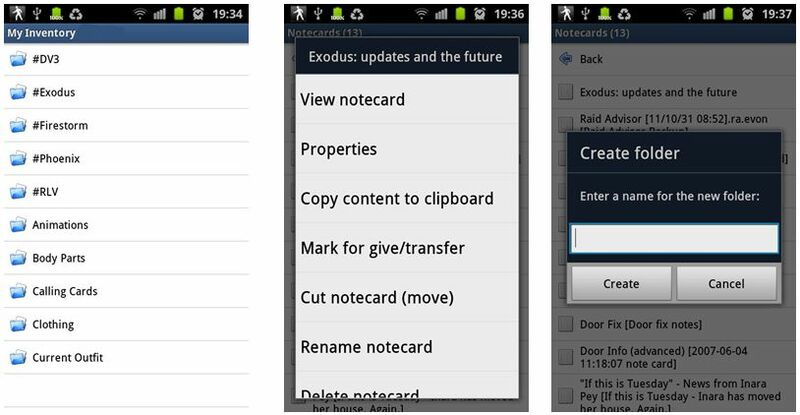 The UI is highly intuitive, uncluttered and a joy to use; it’s quite possibly the most intuitive text client I’ve used to date, requiring little in the way of documentation assistance to help guide the novice user (would that some other Android applications were this easy to get to grips with!). All-in-all a great little package, well thought-out and nicely delivered.